One of our favorite HGTV shows is Design on a Dime. It shows you the $5,000 version of a room and the $500 version. I am always seeking ways to create what I see in magazines, shop windows and movies. Stimulating as this creative style can be, it can also border on crazy making. At least that’s how it felt while I was trying to re-create a “tile rug” we had seen in the Denver Design Center for our master bath. The bathroom also had a toilet in the middle of the wall, hunter green tile and three little glass shelves. 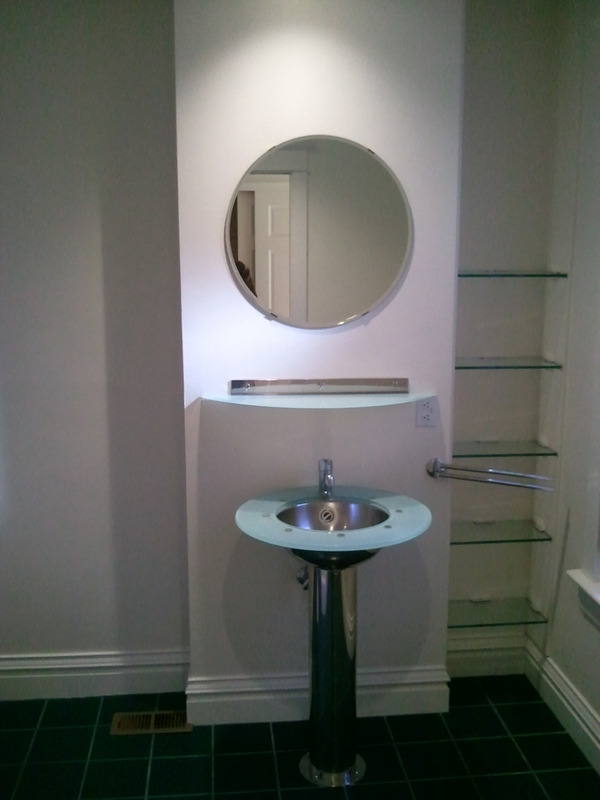 The first thing we did was create space for a water closet and figured out how to fit a double vanity. Then we focused on what it would look like. How could we live with a small space and make it feel fun? 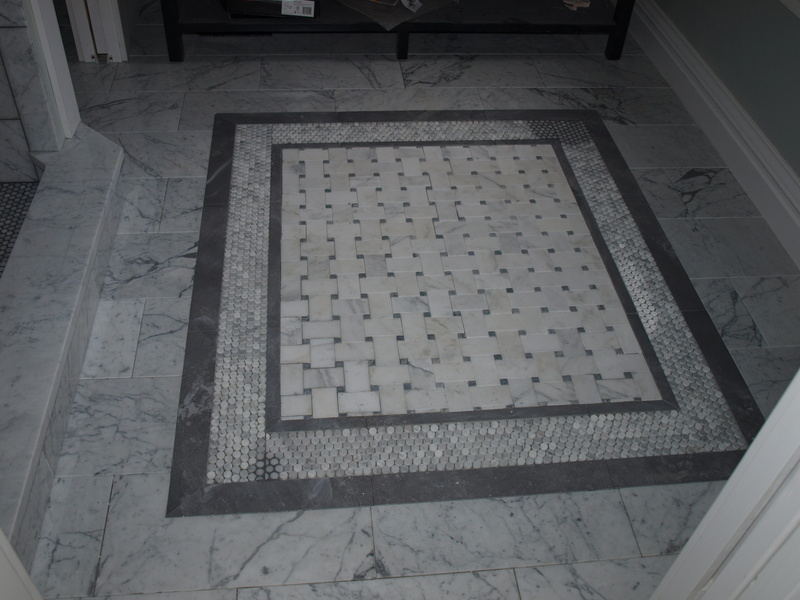 On a visit to the Denver Design Center, we fell in love with a “tile rug” concept embedded on the showroom floor and budgeted for a small splurge. Then reality hit. Did you know that when you like a tile, you wait a few days for them to tell you what it costs? After you scrape yourself off the floor, cause who knew tile could be so expensive, you then wait while they let you know when it will be in stock. (I thought they had it in the back room. Silly me, it was on their showroom floor, wouldn’t it be easy to get?) 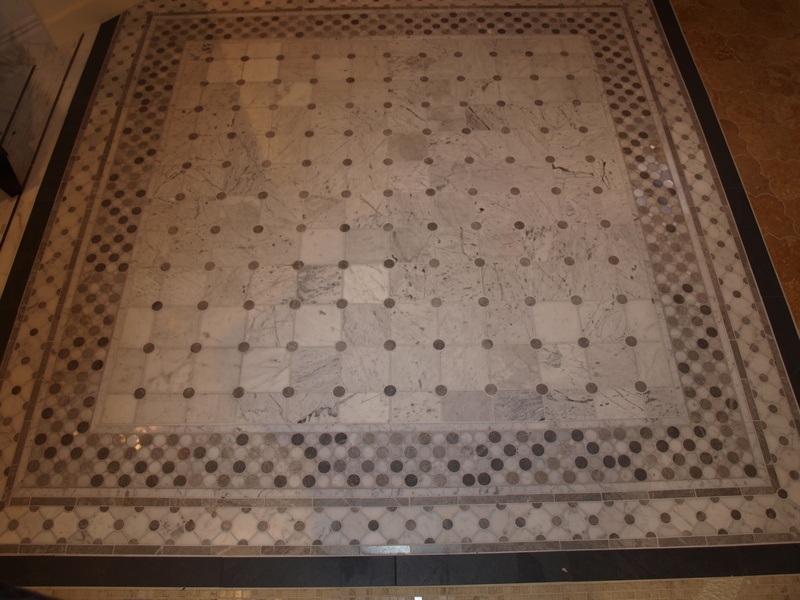 The tile rug we liked consisted of three different kinds of tile. After two and a half weeks of back and forth on how much we needed, the cost, etc. we got word that the center tile was “discontinued.” Really? Ya couldn’t have told me that two weeks ago when I asked about it? Not one to take no for an answer, I literally spent a week online trying to find it somewhere else. I was obsessed. I ended up at the same supply vendor that the Design Center was talking to and got the same answer. There were 5 sheets of it in a warehouse in CT. We needed 8. OK, think…how about if we change the dimensions and use more of the circle surround tile? Great idea! Same scenario. Cost, time, etc only to find that the circle tile was in Turkey and would take 12 weeks to get here, if it was on time. Really? Why not tell me that in the beginning? We needed it in 4. So, after I had a Customer Service meltdown (a common reaction throughout this journey), we let it go and set about making our own version. I scoured the web for tile options and landed at the Floor and Décor outlet on line, where I found a circle tile for 1/3 the price of the Turkish circles. We went to Dahl to find a reasonable insert (again 1/3 the price) and the sale section of Capco to find the slate surround (they practically paid me to take it). Same concept as the Designer rug, different execution. Friday they laid it and we love it! It not only looks good, it feels good and will be a symbol for me everyday – when I look at it, it will remind me of what a little creativity and hard work can produce. We actually ended up creating something that worked even better than what disappointed us earlier. Now, why don’t they make that concept into a TV show? How do you MindFULLY find ways to Design on a Dime? Let us know? Beautiful execution! I love the “basket weave” look of the tile int he middle. and it looks like you used some circle tile on the floor of the shower? All of it looks just lovely. You must be getting close to move in date. Hope you can get settled soon and that your house becomes a home in short order…. great observation, dale! i did use the circle on the shower floor and put a small strip on the shower wall, as well. at $19 a sq ft it was too inexpensive to not use it! thanks for always commenting and cheering me on! I’m an HGTV fanatic too. I had to turn of Design on a Dime, though. I”m just not that handy like Kahi, Frank and the gang! I did watch Save My Bath like a hawk as I tackled renovating my bathroom. It really gave me confidence to ask questions and not settle. Congrats on your floor. Can’t wait to see more. My designer took me to Dahi. It was worth it in the end to work with him and saved me money-the expensive part is laying the title-I also heated the floors but they feel so good!